What if I told you you could go on vacation right now? 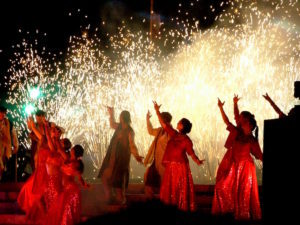 Art mediums like books and movies can transport you to far-off lands, but it can also encourage people to take real trips to other countries. The sensory experience of film can transport you to another world entirely, exposing you to culture, food, music, and art in the span of 90 minutes. So take this journey with Women’s Post as we list eight movies that will inspire you to travel. Like the name, this movie was filmed on location from the streets of Bangkok to Maya Bay in Ko Phi Phi Leh, Thailand. Based on a novel by Alex Garland, this adventure packed film follows a young American tourist. Leonardo Dicaprio plays the young American who finds himself travelling to a secluded island in the Gulf of Thailand and joins a secret community with magical blue waters and pristine lagoons. Despite the wonderful visuals of this movie, this films isn’t all paradise. As the title suggests, this Woody Allen film transports you to the streets and ways of Barcelona, Spain. This romantic comedy follows two American friends on vacation in Barcelona where they put their inhibitions to the side and indulge in a weekend of seduction by a Spanish painter played by Javier Bardem. Woody Allen captured many stunning visuals in this film while promoting the Catalonia region of Spain. Scenes are also filmed in Oviedo, the northwest Spanish countryside. 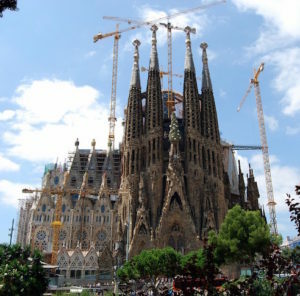 One scene of the movie also captures the Church of La Sagrada Familia, a famous unfinished Roman Catholic Church from 1882. The architecture and seen in this movie will be greatly appreciated. While I may never forgive the ending of this movie, this film captures scenes from Scotland, France and England. 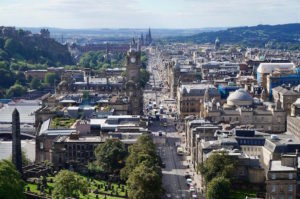 Most of the production took place in Edinburgh,Scotland, where the lead characters of the movie attend University. Scenic views also includes the Brittany region of France and several shots of London. The movie follows two university friends, who always find themselves connecting over the years, eventually invoking feelings of love, disappointment, bad timing and hurt. I discovered this film by mere chance on a long flight — the irony is not lost on me. After watching, I was ready to fly to India and to the French countryside instead. The Hundred-Foot Journey is a witty comedic film with the backing of two powerful people. Produced by Steven Spielberg and Oprah Winfrey, this film tells the tale of a family’s journey from Mumbai, India, to opening up a restaurant adjacent to a Michelin star restaurant in the French countryside. Filming took place in the south of France in Saint Antonin Noble Val. The movie captures the beauty of Southern France and included scenes from Northern Paris. Filmed in the beautiful seaside town of Cartegena,Colombia, this movie visually captures many interesting scenes of Spanish culture. Love in the time of cholera is based off the famous Spanish novel in 1985 by Gabriel Garcia Marquez. This classic tale of a love triangle captures the rustic day to day life of a Spanish lifestyle, with vibrant colours. 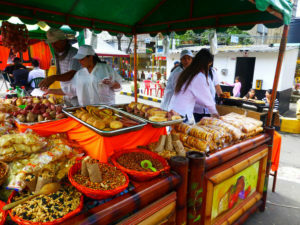 Scenes also include street markets in Bolívar, Colombia and a historic church. This classic Romantic comedy tells the tale of a recently single American woman( portrayed by Diana Lane), who impulsively buys a villa in Tuscany and embarks on restarting her life. The beautiful and stunning scenes showcase the beauty of the countryside. 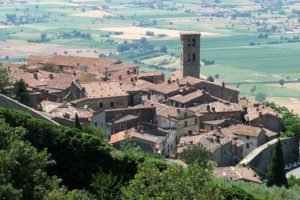 The location of her new villa is in the town of Cortona,Tuscany. Shots also include scenes from Florence and Rome. Diane Lane returns again to deliver another witty romantic and comedic role of an American woman travelling abroad with her husband. While deciding to disconnect from her busy husband and taking the scenic route, Lane’s character travels with her husband’s associate. The pair drive from Cannes to Paris. Like the title of the move, very little of Paris is seen. 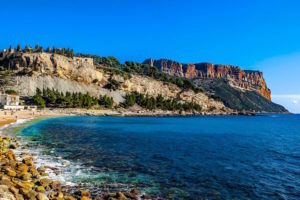 Starting from the French Riviera, the pair drive the countryside of South-Eastern France, there are shots in Aix en Provence, Lauris,and Cadenet, France. I don’t think this list would be complete without the ultimate wanderlust movie. Eat, Pray, Love is the wildly popular film based off a bestselling memoir of the same name. The movie recounts an American woman’s journey to finding her true self after her divorce. Her travels include eating, praying, and obviously, loving. The movie highlights, Italy, Indonesia and India. 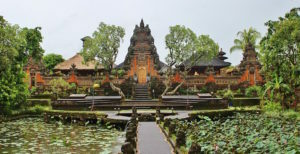 Filming locations included, Bali, Naples, Dehli and New York City , encourages viewers to take a short trip around these amazing countries. Hope this list is able to fulfill some of your wanderlust and you’re off to book your next flight. Let us know in the comments below some movies that have inspired you to travel and explore. Bon Voyage! When I was younger, I would hear news reports that listed the leading cause of death in the world — the number one cause often being stress. I never understood the self-inflicting harm associated with stress and adulthood. When people are younger, they tend to enjoy life, to live freely with caution to the wind. As you get older, you transition and are shaped by your environment. By adulthood, people tend to have their own personality, which they reflect on to the world and are often affected by change. Depending on a person’s psychology and personality, they treat themselves differently in these stressful situations. Some people love the push and rush associated with stress-related work deadlines, and some people crumble at the slightest sign of disruption. From personal stress in your relationships to professional stress related to your job, they are all causing you harm that may end up being a silent killer. A recent survey conducted by job site Monster Canada, found that stress is the leading motivator of people leaving their jobs. Results indicated that employees in Quebec and Ontario feel overworked. The study found one in four Canadians quit their job in 2016 due to unbearable work related stress. Causes are often related to poor salary, location, age and most importantly a work- life balance. While some companies support a positive work-life balance, other jobs can be so demanding there is no work-life balance. Understandably everyone is different. So maybe you’re on the grind, a business entrepreneur, working for your family, living your dream job, but always remember to support the healthiest version of your self and that includes you mental health and managing stress. Women’s Post has compiled some short tips on how to live a more relaxing lifestyle. Sometimes, we all need a little break — just a small moment to ourselves. Deep breathing is often found to calm your heart rate and promote a state of relaxation. Five deep breaths are all you need. Maybe even try breathing exercises or meditation and set aside ten minutes in your day. Just take a day, or a couple days off if you need to regain control of your life again. When you take a day off, commit that day to your self and putting your priorities first. Get a massage, read a book, go shopping, go to a movie alone, and find time to enjoy your own company and activities you love. On the note of relaxing, it’s vital to also spend time focusing on your diet and exercise. Sometimes these activates escape us and the thought of sleep is much more appealing. While sleep is fantastic, working out also hits you with a rush of feel-good endorphins so you end up feeling really fantastic after a workout. Our diets are also very important. A recent study found that eating too much pasta can trigger depression. Now don’t go giving up your favourite foods — just adjust your diet accordingly. Sometimes saying ‘no’ can be the healthiest thing to do for your self. No excess burdens and obligations. Don’t feel bad about what other people think. Do things for your self, don’t over commit and prioritize! If you rather take the time off to go see a movie than volunteering this weekend, do it! Make yourself happy. Spend time with those you love, speak about your problems, your friends and family should be a positive source in your life. Spend time with the people that make you happy, even quick phone calls to the one you love can help alleviate daily stress. Too often we spend our time around people who are full of negative energy and are emotionally draining. You should just cut that negativity our of your life. Just remember that in the end, life waits for nobody, so if you’re finding it hard to keep up, just take a break and I hope by reading this you feel less stressed already. Share some peace and love in the comments below!